Seasoned globetrotters may boast of having toured the world from A to Z (Australia to Zimbabwe), but few, if any, have travelled from Å (pronounced Aw) to Y (pronounced E). Those are two little-known places with the world's shortest names. Å (population 150) is a tiny fishing hamlet in the Lofoten Islands, a granite chain in north-west Norway, in the Arctic circle, while Y is an even smaller French village, with only 29 inhabitants. "Exposed to North Sea gales, the [Lofoten] islands nonetheless enjoy a summer that makes the slender beaches as appealing as the spectacular scenery and abundant birdlife," says a Polish website. "Adjacent to prime cod grounds, the islands' many fishing hamlets are situated at the foot of towering cliffs, inhabited by cormorants, puffins, and guillemots. A road connects the major settlements, the largest of which is Svolvar, site of the main services and a colony of artists. 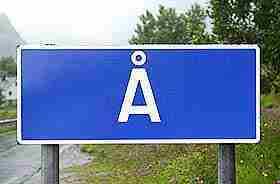 At the island's southern extremity, Å boasts the world's shortest place name." "Large, heated video room with non-stop 30 min. video (English subtitles) – covers everything from the catch, to delivery on the most important market: Italy – plus a 5 min. video in various languages specially intended for groups. "Coffee and waffles [are available] in authentic maritime atmosphere. You can also try tasting stockfish: Lofoten's own 'snacks'. We take pride in offering professional guiding in Norwegian, English, German, French and Italian." The website also reveals that towards the end of April, an area of 400,000 square metres of Lofoten is covered in stockfish – cod hung out to dry on racks. Every year, 16 million kilograms is hung out, the weight being reduced by about 80 per cent when dried. How did Å acquire its brief name? We e-mailed the question to the Lofoten Tørrfiskmuseum. Back came this reply from Elin Graner: "Å is an old word for a little river. There is a little river coming from the mountains and it ends in the sea here, so that`s the reason for the name. "Å is the last letter in our alphabet, and the very end of the Lofoten road. The Å sign on the road is stolen by tourists every year, so it was decided to write Å i Lofoten instead, to avoid this (it would be too big to steal). "But then the population in Å said 'NO, the name of our place is Å, not Å i Lofoten, so now there is a small sign with only one letter again." Elin said that although Å no longer has a landing station for fish, fisherman families still live there. "Lofoten has been, and still is dependant on stockfish production. It was the first commodity that the vikings exchanged for goods in other countries. Å used to be much larger than it is to-day. Because it is difficult to get a job, young people move to other places." "Unfortunately our plans for whale-eating came to nothing since there was only one café-restaurant in Å. I bought a watermelon and cake for lunch. "After lunch I went alone to the world-famous Stockfish Museum, 'the only one of its kind in the world' (it was not hard to see why). No one seemed to be about at the entrance, so I walked in, took a guide leaflet and had a look around without having to pay. "The museum was hilarious in its irrelevance. Facts such as 'Wheelbarrows were used for the internal transport if fish on the quay until the 1970s', 'With the help of air conditioning the stockfish can be dried a further 5%, turning it into klipfish' and 'Up until 1955 workers had to kneel down on the floor to brace the fish' were read and promptly forgotten. "My desire for stockfish sated, I headed back into Å to have a look around. Many of the buildings in the pretty fishing village have been incorporated into the Norsk Fiskeværsmuseum (Norwegian Fishing Museum). I was able to visit the deserted cod liver oil factory, fisherman's house, forge, bakery and woodshed. This was all very interesting but could have done with a bit more explanation." Despite Matthew's criticism, Å is a picturesque and popular tourist resort in summer. 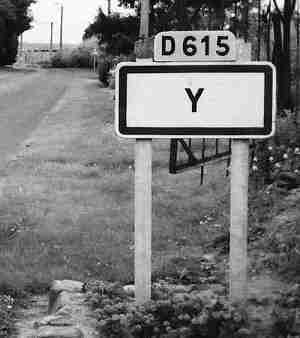 Some 1,500 miles to the south lies the French village of Y. Its brief name dates back to 1241. Y is near the township of Ham ans Athies in the department of Somme in Picardy. In World War I (1914-18), the Somme, on the Western Front, was a bloody battlefield, where more than a million British, U.S., Australian/New Zealand, French and German troops were killed in two horrific encounters. The American Somme Cemetery, 98 miles northeast of Paris, contains the remains of 1,844 soldiers, most of whom served in American units attached to British armies or in operations near Cantigny. Famous German flying ace Manfred von Richthofen (the Red Baron) mentioned the village in his book, Der Rote Kampfflieger, published in 1917. An English language version was published in 1918 as The Red Battle Flyer. "We went on a shooting expedition on the twentieth of April," he wrote. "We came home very late and lost Schäfer on the way. Of course everyone hoped that he would come to land before dark. It struck nine, it struck ten, but no Schäfer was visible. "His benzene could not last so long. Consequently, he had landed somewhere, for no one was willing to admit that he had been shot down. No one dared to mention the possibility. Still, everyone was afraid for him. "The ubiquitous telephone was set in motion in order to find out whether a flying man had come down anywhere. Nobody could give us information. No Division and no Brigade had seen anything of him. We felt very uncomfortable. At last we went to bed. All of us were perfectly convinced that he would turn up in the end. "At two o'clock, after midnight, I was suddenly awakened. The telephone orderly, beaming with pleasure, reported to me: 'Schäfer is in the Village of Y, and would like to be fetched home.'" And that, judging by the Internet search engines, was the last time anyone seems to have heard about Y*. Wondering why the name of the Norwegian hamlet is written as Å instead of A? The Norwegian alphabet has 29 letters, three more than English. The extra characters are Æ (æ), Ø (ø) and Å (å). They're pronounced as the vowels in pat, pert and port. Norwegian computer keyboards have three extra keys.